If I were a cavalryman I’d prefer a regular horse. Not one with the magical ability to sneeze an enemy spearsman out of its nose. I’ve now checked the scrollover text which, voila, renders my gag redundant. Thanks a bundle. Its okay Adam, i read your comment before the mouse over. So you got the laugh. Is the horse (and all the strappings) meant to look like they’re made out of clay? I don’t like the font. No logical reason for my dislike though. Yea I’m not sure what the hell that is either. And when does wood give off a glow like that? I wouldn’t want to go up against a Roman Cavalryman unless I was armed with Glowy Wood.Glowy Orangey at the ends and Glowy Silvery in the middle. ‘One of the rising stars of Celtic fantasy’ should have been enough of a warning for any of us. That’s one fugly horse too. Although to be fair its looks weren’t probably helped much by having its bridle and reins inserted under its skin. 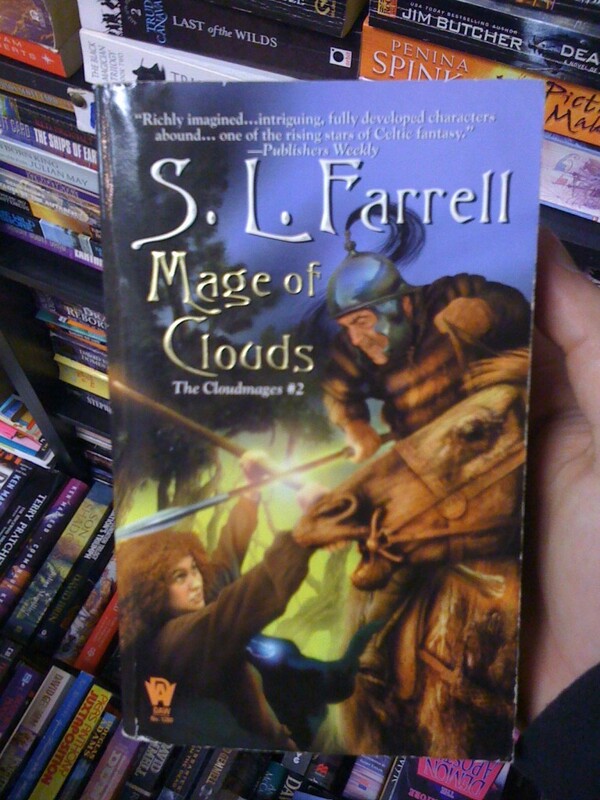 And if Book 2 of The Cloudmages is called Mage of Clouds what on earth did they call Book 1? You would have though Mage of Clouds would be the title for Book 1 of The Cloudmages so that Book 2 could be called Another Mage of Clouds. And hey, isn’t ‘cloud’ one of those words that just looks wrong if you repeat it enough? I’ve read this book, so I can safely say that it is in fact a crazed redhead turning a horse and rider into wood using a magic staff, not a crazed redhead spearing a horse. Not that that makes the artwork any less hideous. @Simon: Book 1 was The Cloudmages. Book 3 was Cloud of the Mage. Book 4 was Wossat Then, Eh? (due to a typesetter’s error). Book 5 was Segamduolc Eht and was felt to be the most Celtic of the series. Or going by the image, maybe Mage of Goads? That horse is so surprised! Q: What is “Celtic Fantasy”? A: Fantasy written by Americans who have zero knowledge of Celtic history and culture but have seen lots of “Celts” in movies and think they themselves are “Irish”, for Americans who have zero knowledge of Celtic history and culture but have seen lots of “Celts” in movies and think they themselves are “Irish”. @A.R.Yngve, a quick google search shows the author comes from that noted heartland of Celtic culture, Ohio, and resides in that other Celtic heartland Kentucky. I wonder if the artist ever considered suing Pixar? It seems obvious they stole the design for Princess Merida from this cover. Of course that would mean having to admit they created it, so maybe not.